Electric motors in pharmaceutical industry consumes significant amounts of electricity; estimated to be about two-thirds of all usage. Even a simple air conditioning system, costing a few hundred pounds, can be expected to consume many tens of thousands of pounds worth of electricity over its useful lifetime. 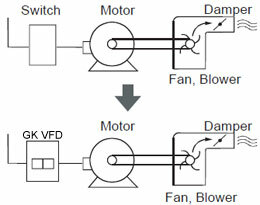 Variable frequency drives can help to make significant energy savings by controlling the motor speed. Creating closer links between these two areas of a business is an important objective. Tools like online variable frequency drive payback calculators will go some way towards achieving this; however, by themselves they won't produce a result – there also has to be real buy-in from the business itself. The supply chain also bears part of the blame for the industry's lack of confidence in variable frequency drives. In the majority of cases, buying teams look for a solution to a manufacturing problem, in the form of a complete system. As a result, machine builders and systems integrators will compete on sale price, but not on the overall system cost including energy consumption. This means that variable frequency drives are often regarded as non-essential optional extras. However, 90 per cent of the lifetime cost of an electric motor comes from its energy consumption. It is therefore clear that the energy cost of a system should be the first thing a buying team look for in a quote, as it may well be the single item that most effects the bottom line over time. This is particularly true in pharmaceutical industries, where pumps and fans are widely used for liquid and air movement. In these kinds of applications, using variable frequency drive turning down the speed by 20 per cent can translate to a 50 per cent energy saving in a fan, for example. This problem is exacerbated by the fact that motors are often over-specified in such industries, so they can cope with worst case scenarios. Adding a variable frequency drive wouldn't remove this ability to manage in extremes, it will just reduce its cost on a day-to-day basis; it's an investment decision that shouldn't require an extended period of due diligence. The cost of energy is important, but the security and continuity of energy is crucial for many industry sectors. Maintaining a reliable energy supply requires both businesses and individuals to consume less - and this is exactly what variable frequency drive can help process companies achieve. Put simply, variable frequency drives can be seen as a form of insurance against future energy price increases. They both reduce the bill in proportion to its overall size, and improve the long-term business model of the energy industry by increasing the likelihood that it will be able to help the Government meet its energy reduction targets. The good news is that there are some systems integrators and machine builders out there who have started to use the energy efficiency of the equipment they produce as a selling point. The ones that are doing it sooner rather than later are differentiating themselves on the market by being more helpful to the customer and providing a more rounded service. This should become the norm. If pharmaceutical companies become more aware of money saving opportunities, then they will ask for smarter solutions; this will cause systems integrators to react accordingly. Equally, buying teams and purchasing departments are starting to understand that it's the overall system cost that is important, not the purchase price alone. Recent economic turbulence has resulted in closer inspection of how money is being spent and a more discerning decision making process. Variable frequency drives can be a key part of economic recovery for the pharmaceutical industry. The call for higher levels of energy efficiency has been made loud and clear, however, one must bear in mind that variable frequency drives are not the panacea to all problems. Variable frequency drives are not suitable for all types of motor applications (What types of motor can be used with VFD? ), so engineers should always consult the specialist resources provided by the supplier when specifying one. In conclusion, the evidence is clear; variable frequency drives are one of the lowest risk investments to bring its environmental and economic goals a step closer to fruition. If you are part of a buying team, variable frequency drives could be a viable solution to provide significant energy savings in many motor applications. All you need to do is adjust the way you view the system cost of each engineering solution you buy, where lifetime cost is considered over purchase cost.